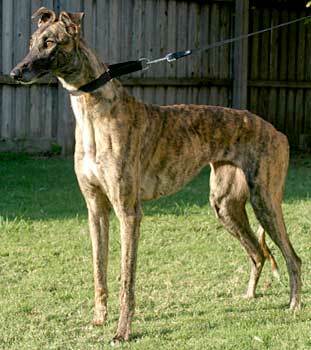 Gwen is a beautiful, 3-year-old dark brindle female born November 2004. At this time Gwen's registration tattoos are still being identified. Gwen, along with Wick, was confiscated during a drug bust in Amarillo. GALT was contacted by the SWAT Captain of the Amarillo Police Department to take these two. Gwen and Wick were found in a 5x5x5 foot cage without food and water when the property was raided. They were transported to Dallas and began their new life. Fortunately, other than being thin, Gwen is in good medical and physical shape. Gwen is not to be trusted with cats. She displayed some darting action when she met them. The intensity of this behavior increased when checked again two hours later. She can be introduced to small dogs at a later time. 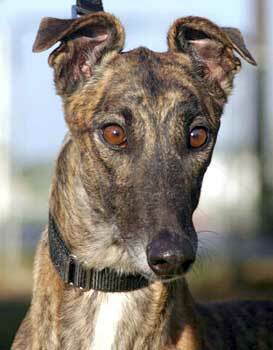 Gwen is a sweet, playful young lady who is always excited to go out for a walk around the neighborhood. She can be a little shy when you first meet her, but she warms to you quickly once she gets to know you. We don't crate her, but she likes to go in it from time to time. She is fully potty trained and is very good at letting you know when she needs to go outside. Gwen would probably be okay as the only dog in the household (that's really difficult to know for sure), but would gladly enjoy the company of another canine! 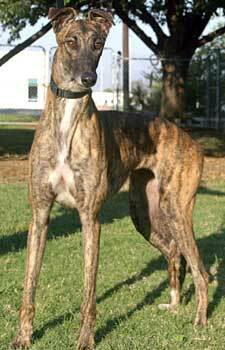 Her current buddy is a male Greyhound. Gwen is not cat tolerant, but as of yet has not been tested with small dogs. Considering her background and what she has been through, Gwen is doing just great.